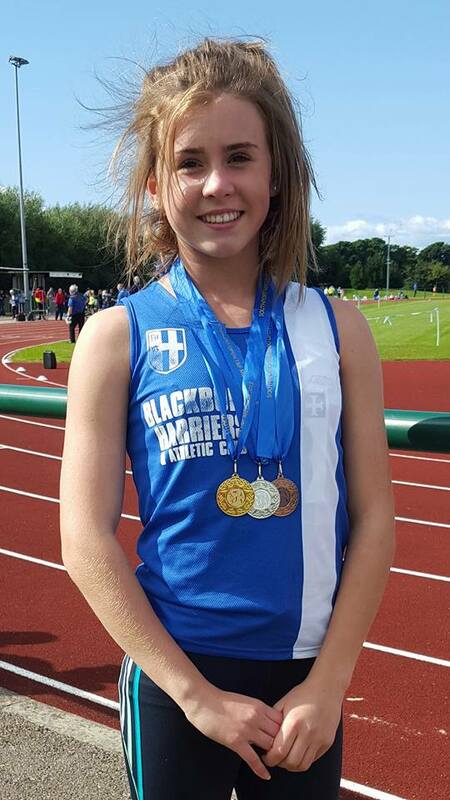 The start of a very good weekend for Emily Warren took place at Litherland on Saturday when she won Gold, Silver and Bronze medals, setting a new PB along the way in the 100m. She won the 75m Hurdles in 12.0sec and Heat 2 of the 100m in 13.1sec before taking 2nd spot in the 300m in an excellent time of 44.8sec for her first ever attempt at the distance. Also out at Litherland were Myah Booth, Jonathon Gough and George Whittaker. Myah took 3rd spot in the 70m Hurdles in 13.1sec, 5th in the Javelin with a throw of 14.45m and 4th in Heat 2 of the 150m (23.7sec). Jonathon was 4th in the 100m (14.7) and 4th again in the Long Jump with 4.19m a new PB – George came 3rd in the 800m (2.58.1), his first ever attempt at the distance and 8th in the Long Jump with a new PB of 3.76m. Then it was over to the Javelin for George placing 4th with a throw of 20.58m and yet another new PB for this very enthusiastic young athlete. 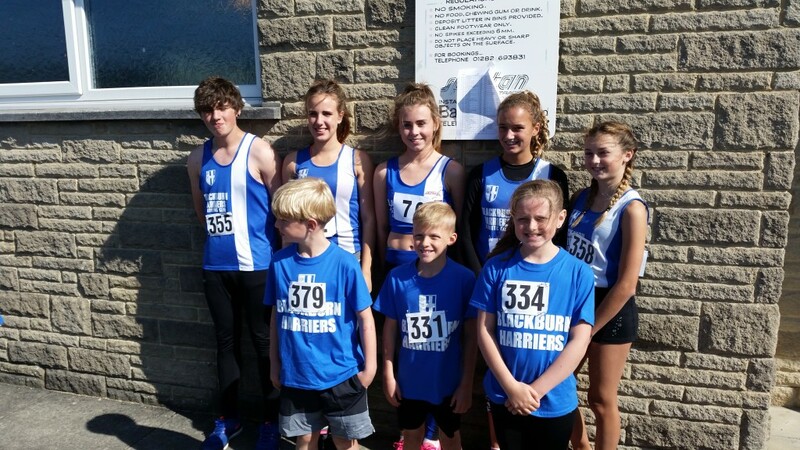 Then on to Pendle which saw Emily Warren, Ellie Littlefair, Olivia Blow, Emily Raine, Harrison Allcock, Code Dewhurst, Ellie Hallam, Charlotte Williams, Connor Davison and Jacob Roberts in the pursuit of more wins and PB’s and they didn’t disappoint. 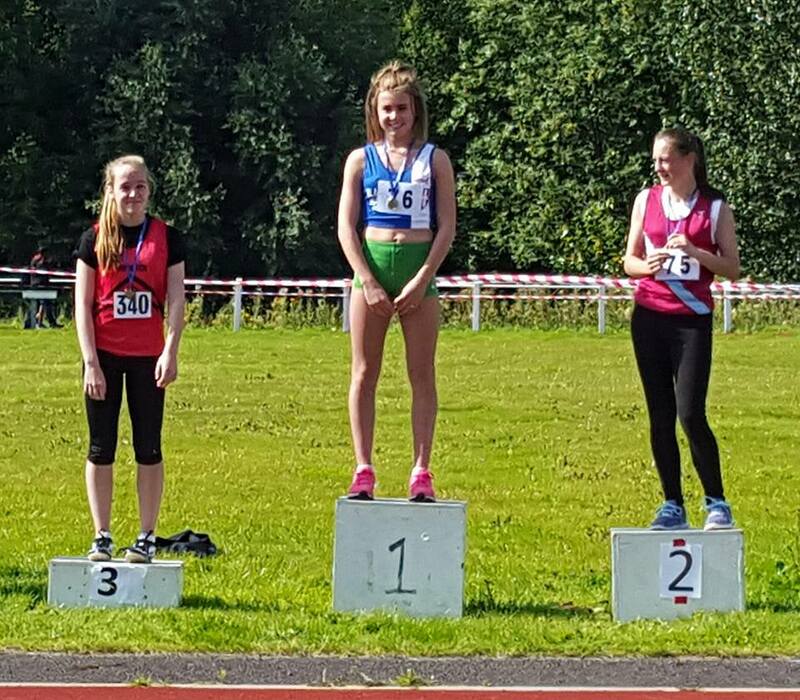 U13 Emily Raine had a good day here winning the 100m Final in 14.3sec, won her Heat of the 200m in 29.9 and then placed 2nd in the Final with 30.4 before finishing joint 2nd in the High Jump with 1.25m. Olivia Blow (U13) came in 5th in the Long Jump with 3.28m, 4th in the 200m Heat with 30.09sec and 6th in the Final (31.8sec) and backed that up with 2nd place in the Shot Putt (6.05m). 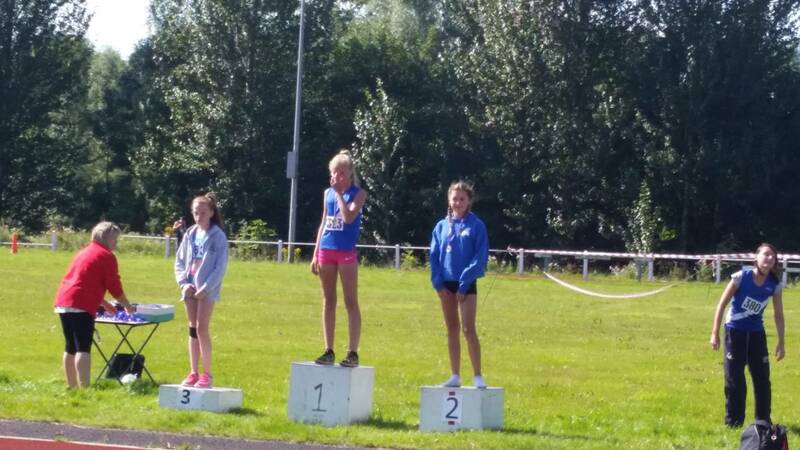 Emily Warren (U15) on fire from the day before at Litherland was the only competitor in the 75m Hurdles where she posted a good time of 11.9, then won the 100m in 13.3sec and 200m in 26.9sec which was a new PB by nearly half a second. Charlotte Williams (U15) and Eloise Littlefair (U15) both set new PB’s, new Meeting Records in the Hammer and Shot Putt and in the process set new Club Records too. 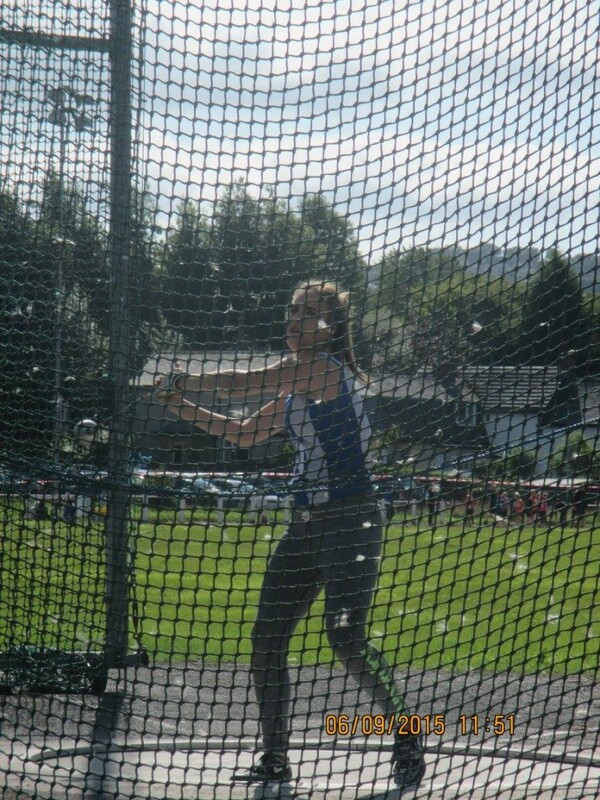 In the Hammer Charlie won with a throw of 48.62m which took her to 4th place in the National Rankings and in the Shot Putt Eloise won with a throw of 11.00m which took her up 15 places in the National Rankings to 29th. 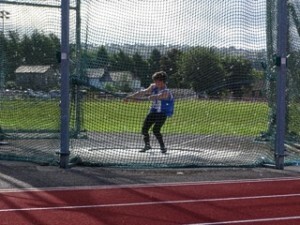 Charlie then took 2nd in the Discus (24.93m) and Eloise 3rd with 23.04m. 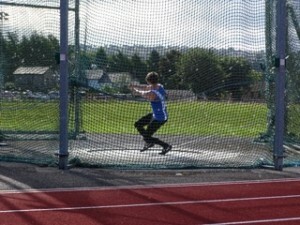 On the Male side of events at Pendle Anthony Kent (U15) continued his fine season with a win in the Hammer (35.36m). Jacob Roberts (U17) who just seems to be throwing longer every time he competes, set a new PB, a and new Meeting Record and a new Club Record when he threw 58.69m in the Hammer which puts him at 10th in the National Rankings. U17 Connor Davison kicked off his competition with a win in the Discus (29.09m) was 3rd in the Javelin (29.08m) and reached 11.10m in the Shot Putt. Senior athlete and V50 Tony Balko had his final fling of the Season throwing 34.46m in the Hammer (6.0kg), 36.53m in the Discus (1.5kg) and 10.13m in the Shot Putt (6.0kg). Sportshall Athletes Harrison Allcock (U10) came 2nd in his 75m Heat (12.1sec) and 2nd again in the Final with 11.9 sec He took 3rd in the Long Jump 2.86m and cricket ball 22.45m. Code Dewhurst also U10 ran in the 75m Heat and was 5th (13.4 sec), 9th in the 800m (3.24.1) and cricket ball 21.15m. 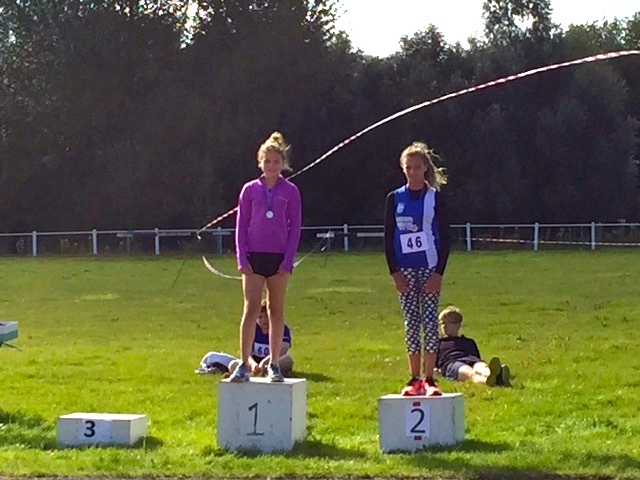 Ellie Hallam U10 ran the 75m in 14.4 sec. Liz Greenwood was selected to run the 1500m Steeplechase for the North West which was held over a four day period last week.In the Steeplechase she came 3rd with a time of 5.25.18 and behind Alex Barbour (Southern Champion in 2nd) and Yasmine Austridge who won the Race (English Schools and National Champion) which ranks as a very good performance by Liz. 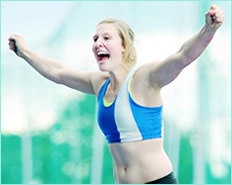 She told the Club that she had “had an amazing four days at the sainsburys school games in Manchester and the event was a fantastic experience. Gaining a bronze medal in the steeple chase topped the four days off particularly as it was my first attempt at a competitive steeple chase race”. This years Championships were held as part of the 10000m Festival at Stretford on September 5th and Gary Priestley ran in the ‘A’ Race which was won by Dan Cliffe in 29.46.75. 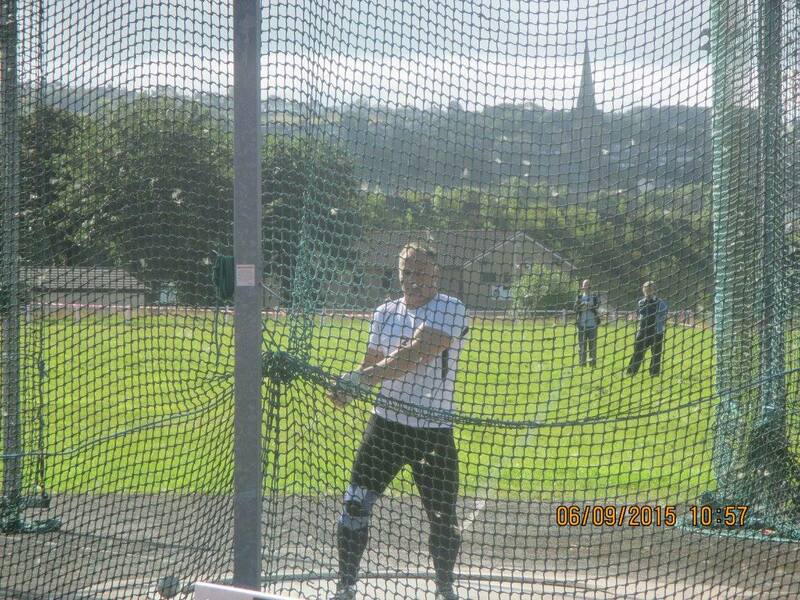 Mike Hazlewood had another good competition in Sweden, taking 2nd place and Silver in the Huddinge Throws Pentathlon at the weekend and despite the bad conditions Mike set two new PB’s. Speaking to the Club Mike said “A big thank you to Huddinge AIS for a well organized and run Throws Pentathlon – despite failing to talk with the local churches to organize better weather!!! Also well done to all the officials and my fellow competitors for competing despite the weAther. I was pleased with my result given the conditions. Hammer 40.07 (pb), shot 11.63 (pb), discus 35.60 – in the wet!, jav 35.74 ( 37nt -flat), weight 14.39 (after 2 x nt – out the sector – just a bit of pressure!!!) points 4014.“…….when the points total was revealed, Mike described himself as “happy bunny”.